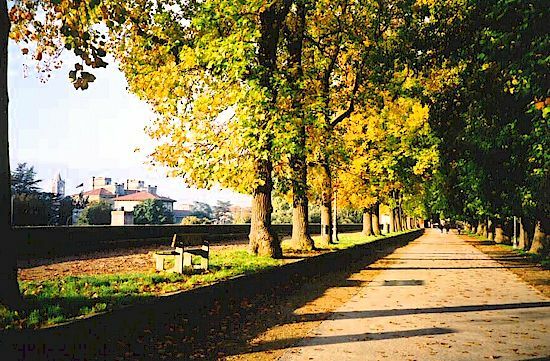 Tourist information - what to see and do in Lucca. and traversed by an extremely agreeable footpath. 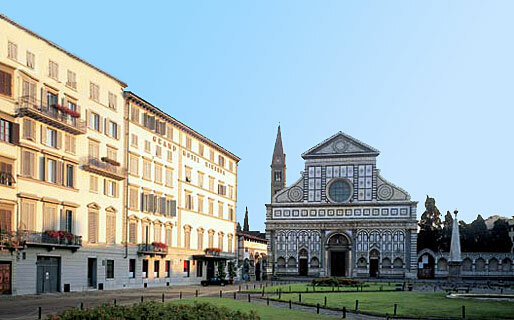 Vacation accommodations and hotels in Lucca. The cathedral of Lucca, the Duomo of San Martino, which dates back to the 6 C, was rebuilt in Romanesque style in the 11 C, consecrated by Alexander II (1070), and again restored in the quattrocento, when the beautiful columns of the upper arches were added. Click the small pictures for a larger view. In the apse there are three large windows painted by Ugolino da Pisa. Among the sculptures are Civitali's equestrian statue of St. Martin dividing his cloak with the beggar, the Deposition by Nicolò Pisano, and the Adoration of the Magi by Giovanni da Pisa - all three located on the façade. Inside the cathedral there are pictures by Tintoretto and Parmigianino, and a Madonna by Frà Bartolommeo. But the most celebrated work is the Volto Santo, an ancient crucifix carved in wood, with Christ clothed in the "colobium", a long sleeveless garment. Throughout the Middle Ages this image was regarded as a palladium by the Lucchesi, who, on their journeys to every country, distributed copies, thus giving rise to the legends of St. Liberata and St. Wilgefortis, of the "heilige Kummernis" of the Germans and the "Ontkommer" of the Dutch. San Frediano is the only example of Lombard architecture preserved without notable alteration, excepting the façade, which is of the year 1200. S. Maria foris Portam, S. Michele, S. Romano, and the other churches all possess valuable works of art. The tomb of the Lucchese poet, Guidiccioni, is in the church of S. Francesco (quattrocento). The Palazzo Pubblico, formerly the ducal palace, was begun by Ammanati in 1578, continued by Pini in 1729, and further enlarged by Prince Bacciochi in the 19 C. Adjoining are the library. It houses many valuable manuscripts and a picture gallery. The Manzi palace contains a collection of paintings. There is a magnificent aqueduct of 459 arches, constructed by Nattolini (1823-32). The archives of the capitol and the archiepiscopal palace are important for their many private documents of the early Middle Ages. The Case Guinigi and the Guinigi Tower represent a marvellous example of Medieaval architecture in Lucca. The Case Guinigi were a group of mansions and towers where one of the most important families of the town, the Guinigi, lived. Paolo Guinigi ruled the town during the first half of the XV century. Today only one of the four original towers still survives and it may be visited. It is 44.25 m high and was made with brick, sandstone from Matraia and Verrucano from the Monti Pisani. It was started in 1384. From the top of the tower, where seven holm-oaks grow, a wonderful view of the town and the countryside may be enjoyed. The loggia and the porch on the ground floor of the tower have been closed, as have the stone arcades which characterized the mansions. Fine mullioned windows are visible in the upper level of these buildings. Montecatini Terme, 30 km east of Lucca, is a wealthy and popular summer resort located at the foot of the Pistoian mountains. The baths and spas date back to the fourteenth century and nowadays there are nine fully-functioning 'terme' spread around the town. There are many extremely attractive golf courses within easy reach. Tuscany was originally inhabited by tribes of Ligurians and by the Etruscans. 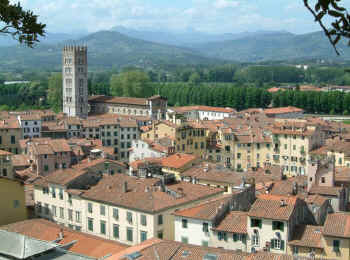 Lucca was a city of the Ligurians. When the Romans arrived, they allied themselves with the Etruscans against the Ligurians who fled into the Apuan Alps. Lucca is first mentioned in 218 B.C., when the Roman general Sempronius regrouped here after an unsuccessful battle with Hannibal. In 177 B.C., a Roman colony was established and in 56 B.C. Cæsar, Pompey and Crassus renewed the triumvirate at Lucca. The main streets of the city were the "cardo maximo" which ran in a north-southerly direction corresponding to the modern Via Fillungo, and the "decumano maximo" corresponding to the modern Via S. Croce, which ran in a east-westerly direction. in his comfortable minibus. Tuscany wine tours and shore excursions are among his specialities. More about Sunflower Tours. The nucleus of the city was the forum which was placed at the junction of these two main roads and which corresponds to the present-day Piazza S. Michele, where the church is still referred to as S. Michele in Foro (St. Michael in the Forum). The circuit of the walls was irregular owing to frequent changes in the course of the river Auserculus, (the Auserculus or Ozieri was the main river in ancient times, while the present-day Serchio was merely a minor branch). The first span of the walls built in the second century B.C. was of rectangular shape, approximately 8 to 9 metres high, built "ad opus quadratus" with blocks of travertine which came from local quarries. The area of the city was 39 hectares and the population was approximately 10,000. The walls were roughly 2,500 metres long, corresponding to the modern Via Mordini and Via degli Angeli (Sommella) in the north; Via Galli Tassi, Via S. Domenico, Via Cittadella up to Corso Garibaldi in the west; Corso Garibaldi in the south; and in the east, Via dell’Angelo Custode and Via della Rosa. The city had four gates along the circuit of the walls: the "decumanus" linking the east gate of S. Gervasio and the west gate of S. Donato; and The "cardo", linking the north gate of S. Frediano and the south gate of S. Pietro. In the second century A.D. the amphitheatre was erected outside the Roman walls while the theatre was built inside. The site of the amphitheatre is within the present walls and its shape is perfectly preserved by Piazza del Mercato. It was built during the I and II centuries and could accommodate over 10,000 spectators. It was covered with marble and decorated with columns but was abandoned during the barbaric invasions. In 1830, Lorenzo Nottolini restructured the buildings erected randomly on the site of the old amphitheatre giving the piazza the plan it has today. Nottolini retained buildings of different heights and opened up an access street. The only part of the original fabric of the amphitheatre left today is the arch on the left through which you enter the square. The other arches in the square were erected in the 19 C.
Lucca has always been an important thoroughfare owing to its location. The Via Clodia was built around 155 B.C. while the Via Emilia was built in 109 B.C. The Via Cassia, linking Rome and Florence, went on to Pistoia from which one could then proceed north to Bologna or turn west towards Lucca. During the Municipium, the most important communication routes were: Lucca-Pisa and Lucca-Luni (Camaiore, Pietrasanta), the latter, either joined Via Emilia Scaura heading towards Luni or, more likely, followed the present-day Via Sarzanese and turned left just after the S. Pietro bridge, which met up with the Aurelia and took you to Massaciuccoli where there are numerous Roman villas and the remains of the Roman thermal baths. In fact, the territory of Lucca is rich in mineral and thermal springs, and there are mineral baths about fifteen miles from the city. The remains of Roman thermal baths have been found in the heart of Lucca, in the subterranean section of the Basilica of S. Giovanni and S. Reparata. For a fine range of hotels, B&B rooms, agriturismi and villas throughout Tuscany bookable on-line - click here. Click here for your vacation in Tuscany - stay in the cool Chianti hills. Villas, country apartments with pool, Bed and Breakfast rooms, vacation rentals. During the Gothic wars, Lucca was besieged and taken by Totila (550). Hoping for assistance from the Franks, the Lucchesi obstinately resisted the attack of Narses, surrendering only after a siege of seven months (553). Lucca later fell into the hands of the Lombards, becoming a place of great importance and the favourite seat of the Marquesses of Tuscany. In 981 Otto bestowed on its bishop civil jurisdiction over the entire diocesan territory but in 1081 Henry IV made it a free city and conferred other favours upon it, especially in the way of trade. This was the origin of the Republic of Lucca, which lasted until 1799. From 1088 to 1144, Lucca was continually at war with her rival Pisa, and either by conquest or purchase increased her possessions. In 1160 the Guelph marquess finally surrendered all right of jurisdiction. Lucca was generally on the side of the pope against the emperor, and hence joined the League of S. Ginesio (1197). In the thirteenth century, despite her wars with Pisa, Florence, and the imperial cities, Lucca increased her power and commerce, but in 1313 the city was taken by Uguccione della Faggiuola, Lord of Pisa. The Lucchesi, however, under the most dramatic circumstances, freed themselves and chose as captain their fellow-citizen, Castruccio degli Antelminelli, known as Castracane (1316), the restorer of the military art, who had been imprisoned by Uguccione. Castruccio drove out the Pisans, obtained for life the title of Defender of the People, and received from Louis the Bavarian the hereditary title of Duke of Lucca. His descendants, however, were deprived of the title by the same prince (1328-9). Castruccio adorned and fortified the city whose territory now extended from the Magra to Pistoia and Volterra. On the death of Castruccio, Louis conferred Lucca on Francesco, a relative and enemy of Castruccio. The Lucchesi, however, placed themselves under John of Bohemia; the latter, in 1333, pawned the city to the Rossi of Parma, who ceded it to Mastino della Scala (1335), by whom it was sold to the Florentines for 100,000 florins (1341). This displeased the Pisans, who occupied the city (1342). It was liberated by Charles IV (1360), who gave it an imperial vicar. From 1370 it was free. In 1400 Paolo Guinigi obtained the chief power, which he exercised with moderation and justice. At the instigation of the Florentines, who sought possession of the city, Guinigi was betrayed into the hands of Filippo Maria Visconti (1430), who caused him to be murdered at Pavia. With the aid of Piccinino, Lucca maintained her freedom against the Florentines. After that the security of this little state, governed by the people, was undisturbed. The revolt of the straccioni discolato deserves mention. It was similar to the ostracism of the Athenians. If a citizen, either through wealth or merit, obtained excessive favour among the people, twenty-five signatures were sufficient to banish him. In 1799 Lucca was joined to the Cisalpine Republic. In 1805 Napoleon made it a dukedom for his cousin Felice Bacciochi. In 1814 it was occupied by the Neapolitans, and later by the Austrians. In 1817 it was given to Maria Luisa, widow of the King of Etruria, whose son Carlo Ludovico ceded it to Tuscany in 1847. Lucca is now the capital of the province of the same name in Tuscany, central Italy, and is situated on the River Serchio at the base of the Tuscan Apennines in the midst of a well-watered, fertile plain, close to the Mediterranean Sea. Its olive oil is exceptionally good although not as good as that produced by your webmaster, of course. located in the Chianti, Italy and Tuscany countryside. Vorresti pubblicizzare la tua attività su questo sito web per Lucca, Italy e ricevere traffico in entrata dalla nostra rete di più di 50 portali relativi? Clicca qui per ulteriori dettagli in merito alla nostra soluzione integrata per una presenza su internet piena di successi. Lucca Tourist Information ©ammonet Infotech 2001 - 2018. All rights reserved.